Handmade silver cross necklace, Quarter Cross Necklace, Sterling silver cross necklace, Unique coin cross necklace. Old Coin NEcklace, Vintage cross necklace. 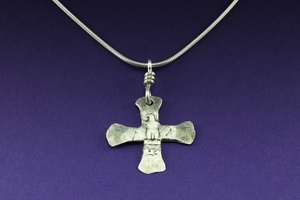 Washington Silver Quarter cut, hammered, and hand filed to make the perfect cross with your choice of bead and sterling silver chain. This coin jewelry necklace can be made with your coins for $80. This handcrafted coin jewelry necklace is made in the USA.